I grew up around hunters. Not tree-stand-sitting recreational hunters dressed up like the front cover of a Cabella’s catalog, but wilderness hunters in blue jeans and flannel shirts, whose families went without if their hunts were unsuccessful. They were more interested in placing shots and tracking animals than memorizing the ballistic data on the latest ubermagnum. They cared about results, not numbers. They hunted with .30-30s, .348 WCFs, .30-06s, .270s, and 6.5×55 Swedes and the like. Growing up, I heard an oft-repeated statement from those who hunted with the Swedish 6.5 cartridge. “It just seems to kill better.” Better than an ‘aught-six. Better than a .308. Better than a lot of things. They couldn’t tell me exactly why, but I learned to love the 6.5 mm cartridges for the same practical reasons, and I have since learned the science behind what those older hunters knew from experience. Let’s put aside all we have learned from high-pressure marketing and gun-counter mythology, and focus on what we can learn from what counts: science and experience. That’s why I sold my .308 AR and replaced it with a 6.5 Grendel. The AR-15 weighs less than a similarly configured .308 AR. It is also shorter with the same barrel length. The balance is noticeably better. Because the 6.5 Grendel is designed for a standard-sized AR-15 rifle, the 6.5 Grendel has an advantage in weight and balance. A 6.5 Grendel rifle from Alexander Arms will tend to be less expensive than most .308 ARs of similar configuration and quality. Alexander Arms is very stringent with quality control on components and construction, so they produce very high quality guns. If you already have an AR-15 or AR-15 lower, A 6.5 Grendel upper drops on in seconds, so to have a Grendel rifle you need only purchase an upper and magazines. 6.5 Grendel offers an advantage in cost over a .308 AR. When all else is equal, a shorter barrel is more accurate than a longer barrel. The 6.5 Grendel, designed for the AR-15 and taking advantage of modern powders and cartridge design, is very efficient from a short barrel, gaining its velocity rapidly. For hunting at longer ranges, a .308 requires a longer barrel to gain the required velocity for expansion. A load with a similar bullet type has a muzzle velocity of 2,387 in a 16.5″ .308, while the same type cartridge in a 16″ 6.5 Grendel has a 2,580 fps muzzle velocity with a much higher ballistic coefficient and sectional density than the .308. A .308 with a short barrel is also concussively loud. A shorter barrel is more maneuverable, lighter, and balances nicely. I chose an 18″ barrel on my 6.5 Grendel, because I hunt in areas where very long-range shots are common. 18″, to me, is maximum practical length for a Grendel rifle intended for typical hunting. Most hunters would be well served with a 16″ or shorter barrel. The Grendel has a strong advantage over .308 in practical barrel lengths. 6.5 Grendel ammunition weighs less and requires less space than .308 ammo. This may seem trivial, but can be a real advantage on long hunts, fly-in hunts in which weight is severely limited, or when meeting luggage weight or space requirements. I have been in fly-in trips in floatplanes in which we had to strip everything not absolutely essential from our gear, including some of our ammo, in order to stay under weight restrictions. Recoil is always a factor. Recoil fatigues the shooter and causes degradation of accuracy (varying in severity depending upon the experience of the shooter). Recoil slows re-acquisition of the target for a follow up shot. The Grendel cartridge has substantially less recoil than a .308, even though the Grendel is a lighter rifle. Sectional density greatly affects the terminal ballistics of a bullet (how it performs once it strikes its target). A lighter, smaller diameter bullet can expand and penetrate better than a larger caliber bullet with poorer sectional density. This effectiveness is not a simple matter of bore size and bullet weight; it is a result of what shape the weight is formed into. For a .308 to have the same sectional density as a 6.5 mm, it would have to be longer and heavier than is possible chamber in a .308 chamber. Imagine a guy standing on a diving board over a pool filled with orange Jello®. He bends his knees, raises his arms, and executes a perfect belly flop. As you wipe of a bit of Jello® that is crawling down your cheek, you notice his identical twin leave the same diving board and dive expertly into the Jello®. Both are now suspended in the quivering pool like bullets in ballistic gelatin. Which one penetrated deeper? The one who hit the Jello® vertically, of course. Both weighed exactly the same, but one had a much higher sectional density. High sectional density helps bullets penetrate at longer ranges when velocity drops, and bullets with a combination of high sectional density and high ballistic coefficient retain their velocity over longer ranges. Almost all 6.5mm bullets have excellent sectional density, so performance on game is outstanding, at least as good as, and usually better, than most .308 bullets. Closely related to the previous points, retention of velocity in important in hunting. Velocity is overrated by those who equate energy with killing potential, but velocity is vital to the killing performance of a bullet in an important way. Every bullet has a minimum velocity at which it will expand as intended. If a bullet is traveling below this threshold speed when it hits an animal, the bullet will not expand (or fragment) and may result in a wounded animal. 6.5 Grendel bullets usually retain their velocity much better than .308 bullets, extending the practical range that game may be taken. The Grendel projectile starts out much slower than .308 at the muzzle, yet is traveling substantially faster than .308 at 1000 meters. The result? The window in which Grendel bullets perform correctly is greater than the .308 window. This is because hunting bullets fail to perform well when their velocities are higher or lower than the velocity at which they were designed to perform (expand, fragment). A particular bullet design will perform well at both closer and farther ranges from a 6.5 Grendel than from a .308. The Grendel bullets do this without requiring magnum-power loadings and blistering muzzle velocities, which means that recoil is very low and barrel life is vastly extended. This makes the 6.5 Grendel an excellent hunting cartridge at longer ranges. The 6.5 Grendel also has a flatter trajectory, making holdovers and adjustments easier. Wind deflection is around half what many popular .308 bullets experience, so a slight misjudgment of wind will result in half the error with a 6.5 Grendel. A deflection of 8″ with the Grendel still puts the bullet in the kill zone, while a .308 in the same circumstances would impact 16″ from the point of aim, outside the kills zone of an animal. This is an argument that people throw around a lot, but it does not make too much sense, when you think about it. Do a few more stores carry .308 than carry 6.5 Grendel? Certainly. But I don’t need to buy ammo at every store. At most stores, I can’t buy the particular .308 hunting ammo that I would use anyway. I have never been out in some remote place trying to source ammo in a little village. If I’m traveling to hunt, I always take plenty of ammo with me. I can buy 6.5 Grendel ammo in my local grocery store. I can buy it at a number of gun stores in my area. I traveled to New Zealand with a 6.5 Grendel rifle and found ammo in a New Zealand gun store as soon as I arrived. Wolf steel case 6.5 Grendel ammo is very high quality, as inexpensive as steel case 5.56 ammo, and, unlike the 5.56, the 6.5 Grendel chamber was designed to fire steel case ammunition. Anyone in the US can order the best 6.5 Grendel ammo directly from Alexander Arms and others. So ammo availability is a non-issue for both calibers. That’s why replacing a .308 AR with an Alexander Arms 6.5 Grendel makes obvious sense. 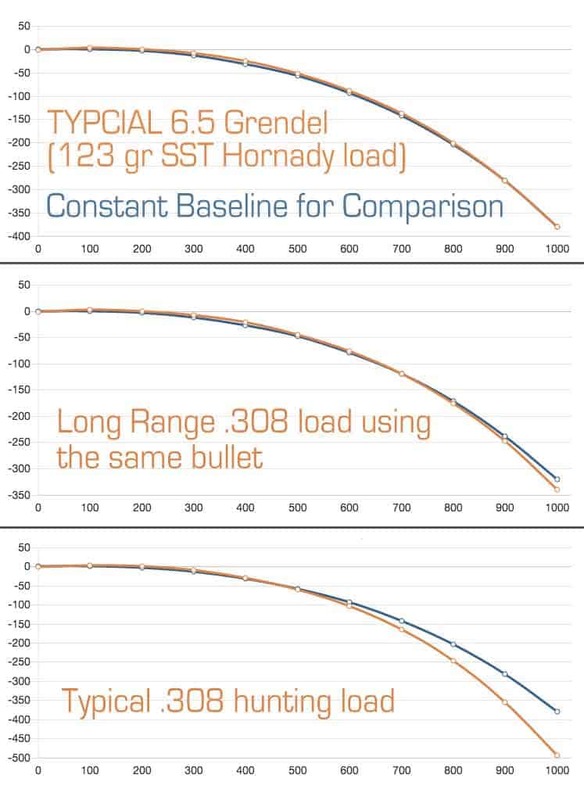 6.5 Grendel maintains velocity better at longer ranges with better penetration and expansion from a shorter, lighter rifle generating less recoil. Because it is flatter shooting with as much as half the wind deflection, errors in judging wind or range do not decrease accuracy as much. Ammunition is easy to find and inexpensive, and the quality of Alexander Arms ammo and firearms is top of the line. Having experienced first-hand the advantages of the 6.5 Grendel on my New Zealand Goat hunt and others, I will probably never buy another .308 AR. This entry was posted in Wilderness Tactical Hunter - Dylan Saunders and tagged 6.5 Grendel, AR, AR-15, Gear, Hunting by Dylan Saunders. Bookmark the permalink. I have an 18″ 6.5 Grendel that I built, and I love it. I have shot out to 400 yards with minimal holdover, and excellent grouping. My next project build is a 20″, i have read that any more than that would be overkill. What? Sell my .308 AR-10, not on your life. especially since I built it. But hell yes I’m going to build a 6.5 Grendel. Keep up the great articles. No way am I selling my .308 AR, especially since I built it with some pretty nice components. But, hell yes I’m going to build a 6.5 Grendel. Keep up the great articles! I personally feel that just because you like the 6.5 in know way justifies the getting rid of 308. While 6.5 is great for punching paper farther then the 308, it still doesn’t compare to the energy you get from 308. This would have been a better article to talk about where the 6.5 can fill a nitch. Not replace. This is James again. This December I killed 2 bucks with my 6.5 Grendel . One was at 100 yards and the other was at 80 yards. Both deer dropped in their tracks. I love my Grendel with the 18inch barrel. I’m 66 years old and don’t carry anything else. No more bolt-guns for me. Semi-auto 6.5 Grendel for flat shooting long range if need be, low recoil(like a 22mag). Trying to talk my brothers in getting a Grendel. My oldest brother saw one of the 6.5 bullets and he said “How will that little bullet kill a deer?” I’ve shot 3 so far with “That little bullet”.I love my Grendel. I have an 18 in h Grendel as well as an 11.5 in pistol. Most of the time the pistol would do just fine but the 18 inch is nice. Are you aware that you said that a shorter barrel equals better accuracy ??? If so. Where in the world did you get this ridiculous information ? There is a common myth that longer barrels equal better accuracy. This is false, though there are two ways in which a longer barrel, though not more accurate in themselves, can cause a shooter to shoot more accurately. The myth of longer barrels being more accurate originated from the days of black powder, but n which long range shooting required a very long, heavy bullet with a lot of powder to move it. Black powder burns slow. It does not actually detonate like smokeless powder does. So it needs a much longer bore in which to expand in order to fully accelerate the bullet. So long barrels were used to get the bullet going fast enough to stabilize and to reach the ranges they shot to in competition. But even in those days, it was discovered that the two-band Enfield 1858 rifles with shorter, stiffer barrels than most military rifles of the day, proved more accurate and were the main rifle issued to Confederate sharpshooters in the Civil War. Smokeless powder required much shorter barrels, and has become even more efficient in modern times, capable of building velocity much faster. Modern cartridge design takes advantage of that, and many modern cartridges gain their velocity in relatively short barrels. So velocity is no longer an issue. Now for the mechanics of accuracy. If we isolate the barrel, we can look at how harmonics affect accuracy in a barrel. When the explosion happens in the chamber, the barrel begins to vibrate like a tuning fork. This vibration causes the tip of the barrel to describe an oval on the air. IF the tip of the barrel is in exactly the same place in its orbit every time a bullet leaves the bore, and if the vibration is exactly consistent from shot to shot, the barrel will be more accurate. However, there will always be some variation, more or less depending on the particular barrel and the particular load, and this is seen in a loss of accuracy. So how do we decrease the movement caused by the vibration of the barrel? We make the barrel stiffer. We increase the ratio between the barrel diameter and the barrel length. This can be done by increasing the barrel diameter, of it can be done by decreasing the barrel length. So in most cases, if you take a 24” barrel and cut it down to 20” or 18”, you will see a measurable increase in accuracy. A shorter barrel is a stiffer barrel, and therefore a more accurate barrel. This is well documented. GPS Sniper School, for example, have cut many police department .308 sniper rifles down to 18” from .24” and have documented substantial accuracy gains. Same rifle, same barrel, becomes more accurate when 6” are cut off the barrel. Now there may be other trade offs, but the fact remains that if all else is equal, a shorter barrel is more accurate. Now, I previously mentioned the shooter’s accuracy. If the shooter is using iron sights, a longer sight radius will tend to make the shooter himself little more accurate. If a shooter is firing offhand, more weight out front can steady the rifle. So there are circumstances in which a longer barrel can help a shooter shoot a bit more accurately, but the gun itself is not more accurate. Great article, I found this incredibly helpful. I have wondered if the Grendel round would be sufficient for elk. And since a 308 is plenty for elk then I have no worries with the Grendel. Yeah well, 308Win has quite a performance and purpose range. There’s a lot of hunting style / military style low powered and low BC ammo around, which you’ll probably not find for the 6.5. That it will do so at the cost of more recoil and concussion and out of a more bulky platform remains true, of course.